Artist Nina Katchadourian eats your lace for breakfast. 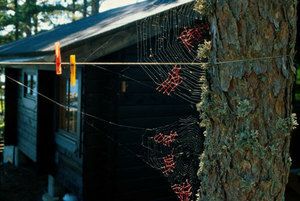 The Mended Spiderweb Series came about during a six-week period in June and July in 1998 which Californian artist Nina Katchadourian spent on Pörtö. 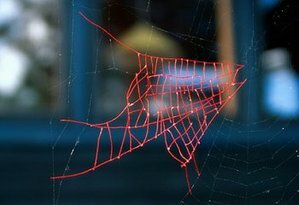 In the forest and around the house where she was living, she searched for broken spiderwebs which she repaired using red sewing thread. So, technically not knitting, but pretty dang badass all the same. In a completely unrelated aside, I bought a box of what I thought were Clementines last week, and am somewhat miffed to discover in the fine print of the box's label that they're actually tangerines. I mean, tangerines are fine and all, but I'm used to thinking "Clementines" when I see that distinctive wooden box in front of the bodega. And tangerines...they ain't them. Petty? Perhaps. But I still feel like I've been had. That's amazing! And honestly: those tangerines were just incredible, so who cares that they weren't clementines? They were so sweet and so intensely flavored. Mmmmm! BTW, I owe you a slew of photos. Dang. That's really incredible and totally badass. Various Artists: The Tokyo Trashville! Get Shirty: "Buy Neutral, Knit Color"